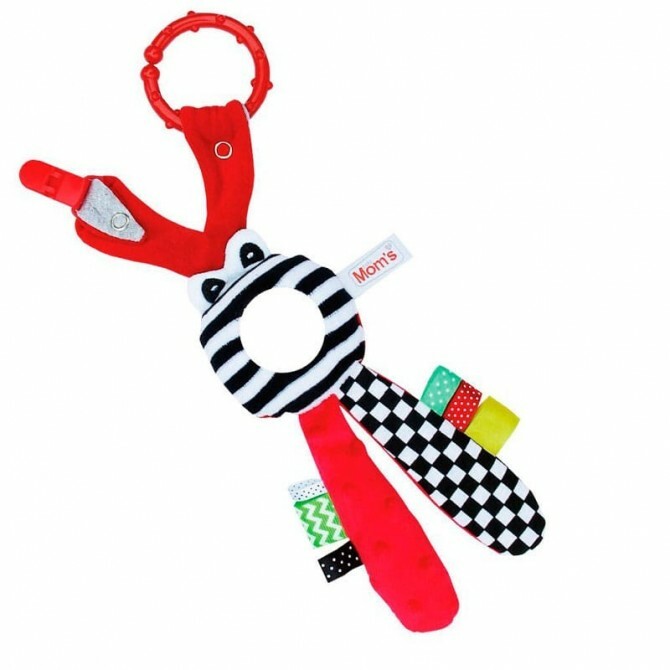 The dou dou scissors is a toy for babies that arouses the curiosity of the little ones. The head is red black ,and it has black and white lines, it has a small plastic mirror as face. The legs have the shape of a pair of scissors, they mix soft red microfiber with black and white dots and squares. The legs also have colorful labels and crispy stuffing. You can use it hooked to the bar armrest of the car with the ring that includes. And you can also carry it attached to the clothes, with a little clip. Your baby will love playing with the doudou sccissors. The legs are different, one with crispy stuffing and the other stuffed. It combines red, white and black with different shapes. You can wash it in the washing machine.